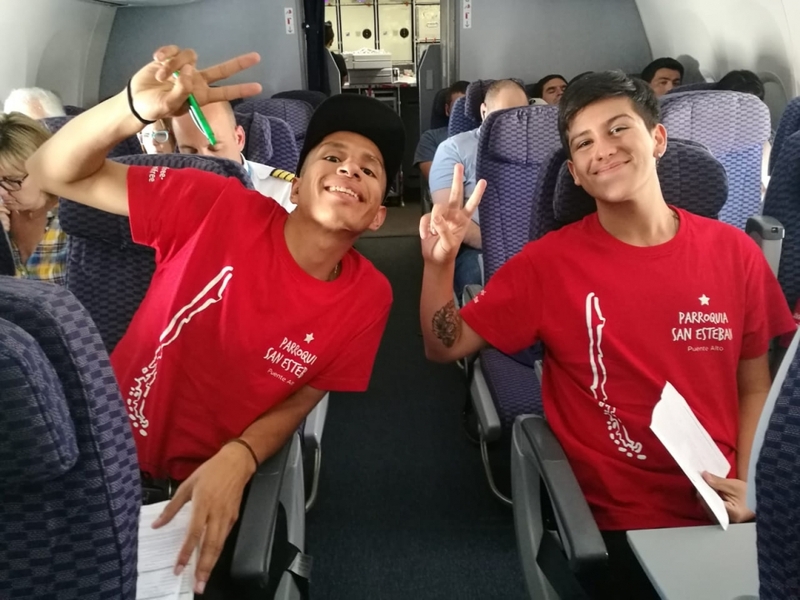 “Happy and eager” were the young Chilean pilgrims during the flight — for many of them, the first in their life — to Panama, where they will take part in the World Youth Day (WYD) from January 22-27, 2019, along with young people from all over the world. The first two groups of Chilean pilgrims traveled last January 9, 2019, from the parish of Saint Barbara (7), in the Eighth Region, and from Saint Stephen’s parish in Puente Alto (18). On that day, a total of 50 pilgrims arrived in Panama, many of them privately. To date, 30 pilgrims have been added to them and in the end, some 1,000 Chileans will take part in the 2019 WYD. Father Ricardo Acosta, parish priest of Puente Alto, explained how he was able to finance the registration and air tickets for the whole group. During the year, they carried out a number of activities to cover the costs of seven young people who could not have traveled. One of them, Rodrigo Reyes, said that they often felt there would be no “opportunity” for them to travel and were somewhat dejected, but then “the funds would arrive. God took care of it,” reads the Webpage of the Chilean Episcopal Conference. “It’s been a lovely experience to arrive here. It has also been intense, given that to find the resources to go to Panama meant leaving much work in the parish, and that implies sacrifice. In any event, we are eager and look forward to living a new experience in Panama,” said Rodrigo. The Chilean pilgrims began their trip on January 9 to the Diocese of Colon — Kuna Yala, 50 kilometers from Panama City. It’s the Atlantic entrance to the Canal and is 50 minutes from Panama City. The Diocese will welcome 15,000 pilgrims. While there, the Chilean young people will hold a missionary week from January 15-21, days in which they will engage in social works and evangelization, before the great Day, which begins on Monday, January 22. They are staying in private homes and parishes in both cities, from which they will go by bus to the different events listed on the official program. A total of 400 young people from Santiago de Chile took part in the “Sending Mass” on Saturday, January 5, 2019, before going to Panama’s WYD. The Mass was held in the Metropolitan Cathedral and celebrated by Monsignor Cristian Roncagliolo, Vicar General of Santiago and Vicar of Esperanza Joven. It’s a traditional celebration that is held weeks before pilgrims begin their journey, on this occasion though Central America, to meet with Pope Francis and young people from all over the world.